Summertime is the perfect season to host a movie night in your own backyard. With just a bit of careful and creative planning, your outdoor screening event will be one your friends and family will not soon forget. 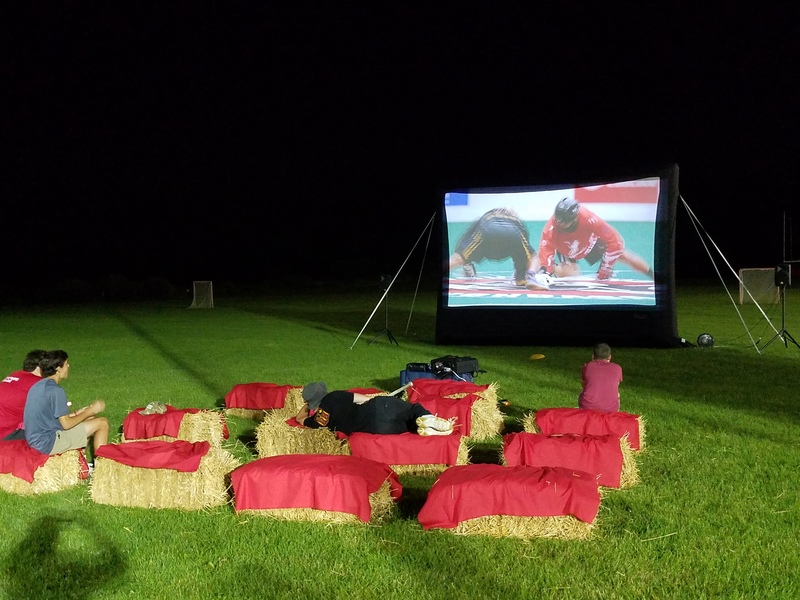 Leap N' Laugh of Rochester, NY, is here to make your backyard movie theater a success. Click here now to book!!! Our 16’ Home Theater System comes with everything you need to have a one of a one of a kind backyard party. The 16’X 9’ screen gives you 144 square feet of viewing area that delivers the unique experience to: 250 guests sitting on the grass, 400 guests sitting in chairs or 1,000 guests standing. Perfect for BBQ’s, Graduation Parties, Birthday Parties, Weddings and even school/sporting events. The media console includes a 3000 Lumens projector, (2) 200 watt powered speakers and a Blu Ray player capable of accessing over 300 streaming services to include: Netflix, YouTube, Hulu, Pandora and Amazon. We also have the ability to tap right into your cable service. IMAGINE your child's face when they play their favorite video game on a 18.5' diagonal movie screen! *Can only be setup around sunset. Rentals will be for 2.5 hour blocks. Price including delivery/setup is $250. Each additional hour will be $100. Feel free to ask about having a staff member stay with you during your rental. From inflatable screens for backyard movie theaters to bounce houses for birthday parties, rely on Leap N' Laugh for everything you need to bring your event to life. Give us a call at (585) 469-8922 today to speak with a helpful representative about ordering party rentals. Visit us online, too, to find out more about our many products and services.